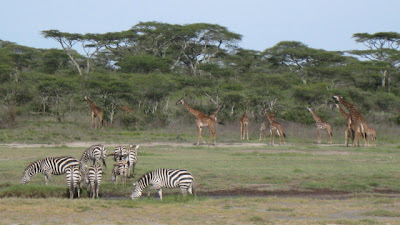 Last week I was on safari, hence no blog. Computers, let alone electricity, were scarce. Communication depended on cell phones and power from private generators. Despite its poverty, Tanzania has done a remarkable job in protecting its wildlife, making ecotourism an important part of its economy. Kenya, across the border, is more prosperous. 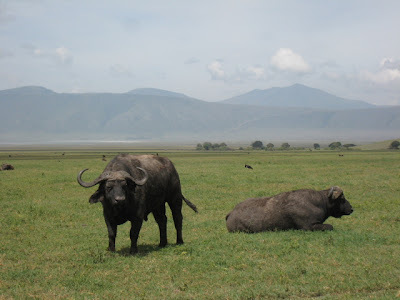 Our original plan had been to go to Kenya because the parks are easier to access, and I had spent a summer doing field biology there 23 years ago through School for Field Studies. I was eager to return and to share the fabulous experience with my family. Unfortunately the US, UK and other countries have issued travel advisories due to the political turmoil in Kenya [a power sharing agreement was just reached today!] About 1,500 people have been killed in tribal conflict and looting. The economy has been gutted. It was such a tragedy to see this happen to a once stable democracy. Since Kenya is the gateway to East Africa, the problems have hurt the whole region. Tanzania is by comparison very stable. 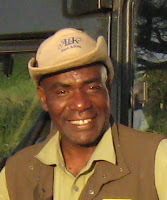 Our Abercrombie & Kent (A&K) safari guide, Ally Mtumwa, explained that there are too many tribes for any one to dominate such as the Kikuyu have done in Kenya, and there is an equal balance between Christians and Muslims. We were not disappointed about switching to Tanzania because the parks are bigger, meaning far less crowding and more animals to view. Also, my father-in-law wrote a memoir about Tanzania back when it was Tanganyika and Zanzibar. Eager to go, we had yet another set back. My mother, who had arranged the trip, broke her leg skiing, so my parents were unable to join my family and Henry’s parents. We had to add 2 more travel days to reach our new destination. It took 9 hours to fly from London to Dar es Salaam, the former capital of Tanzania. 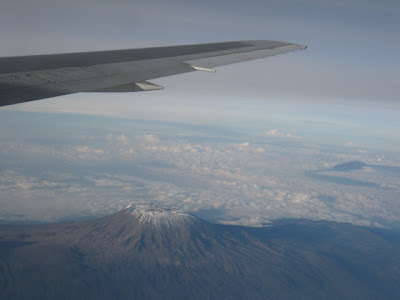 We then transferred to a small plane to fly to Arusha. I reread Hemingway’s “Snows of Killimanjaro” as we flew the the path of his death bed hallucination. The main streets were decorated with American flags, and we had spotted President Bush’s jets at the Dar es Salaam airport. At almost every stop on our itinerary, Bush was either a day before or behind us, often causing delays as streets were shut. It was the first visit of an American president to the country, and the people appreciated it and the fact that the US (followed closely by the UK) are the biggest donors to Tanzania. We boarded yet another small plane. We scattered ostriches on one dirt runway and giraffes on another. 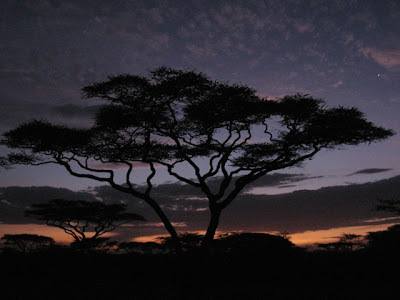 The Serengeti National Park is about the size of Massachusetts; it means endless plain in Maasai and is home to The Great Migration. Every year over a million wildebeest migrate from Tanzania to Kenya in search of water. Wildebeest and accompanying zebras stretched to the open horizon in every direction, moving constantly. Many calves and foals are part of the journey. Photos can’t capture the scale of it. You have to see it in person. My daughter recorded 26 species on our first day, not including birds. I spotted an elusive Serval cat and lost track after counting 30 giraffes – a herd is called "a journey of giraffes." A majestic lion scratched himself on the bumper of our Land Rover. 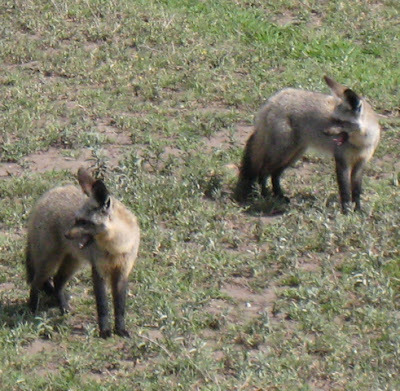 I had never seen bat eared fox before, and what a delight to find a litter of playful pups. Our A&K mobile camp couldn’t have been more comfortable. In Kenya I had shared a 3 man tent with 2 other teenagers and on one occasion a tarantula. We used an outhouse or a shovel. 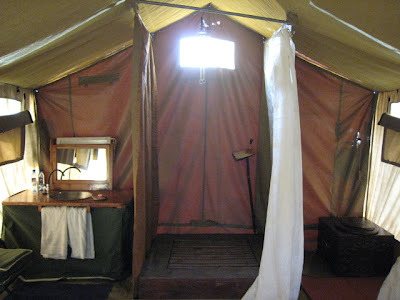 At the A&K camp our tent had a king size bed covered in mosquito netting and a flush commode. A bucket of warm water worked for showers. We were woken by lions roaring at night. 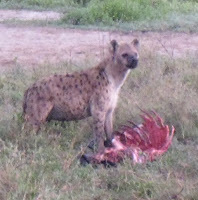 We left camp before sunrise to find hyenas and a jackal at one kill and lions at another only a half a mile from our tent! The prey were wildebeest. The lionesses are the pride’s hunters, not the males. Lions spend most of the hot day resting; you need to get up early to see the action. Like a scene from The Lion King movie, we drove out into the endless plains and found several lion prides napping on kopjes or up trees. We had packed our lunch, but most of the good picnic spots were already taken by . . . lions! 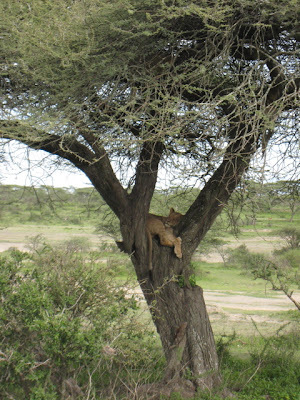 We thought we’d found the best spot under a shady tree, but our guide insisted on circling, and sure enough, hidden in a bush, was a napping lioness. Close call. We did finally find the perfect spot but had to watch for deadly snakes. Having a good guide pays both in safety and what animals you will see. A&K is meant to be the best. It’s not just big game, Tanzania is also a birder’s paradise. 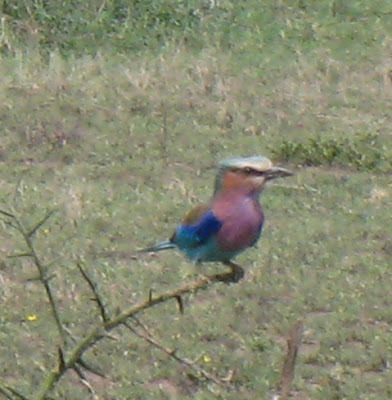 One of my favorites is the lilac breasted roller. They used to hang around our campsite like sparrows in Kenya. Every morning we were woken by a chorus of birdsong. Lying in a tent listening to the sounds of the wild was the best part. The hyenas made a wonderful “whoooop” sound and laughed while feasting. 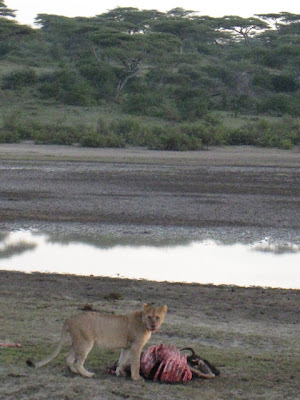 Lions grunted while dining. At night we were treated to beautiful but equator-fast sunsets. We sat around the campfire, watching the moon rise and roasting marshmallows. With so little electricity and pollution to contaminate the sky, the stars were so clear. The air was fresh. Evenings were pleasantly cool and daytime temperatures about 80 at the higher altitudes. What a change from the cool, damp English winter! 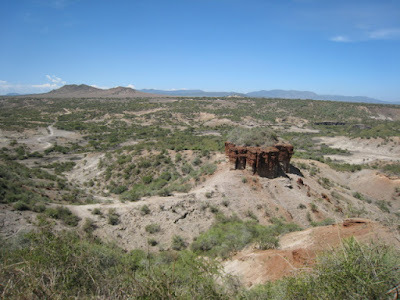 We left the Serengeti to drive to Olduvai Gorge, “the cradle of mankind.” Its real name in Maasai is Oldupai, named for a plant we call Sisal, but a German explorer got it wrong. Mary and Louis Leakey found 3.7 million year old footsteps of Australopithecus Afarensis in the gorge. The Oldupai Museum was worth a short stop. We then climbed a steep road into the mountains, looking back over the Serengeti plains. 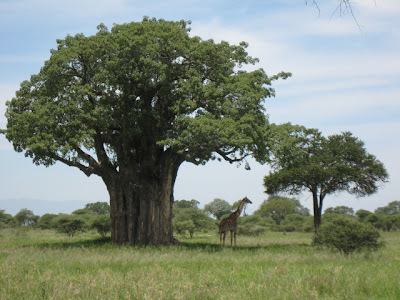 The hills were dotted with miniature acacia trees dwarfed by dozens of giraffes. The giraffes stood tall and elegant like carved toys. The higher we drove, the cooler and wetter it became. The dry dirt and yellow grasses became red dirt and dense, tropical vegetation. 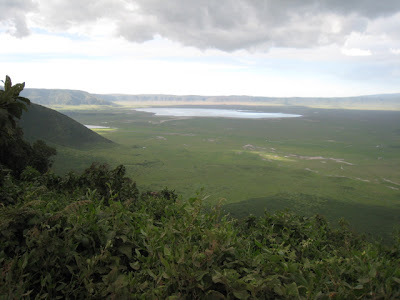 We were heading to the Ngorongoro Crater, a volcano that collapsed into itself and became its own ecosystem with only giraffes missing. They can’t manage the steep incline. It feels like Eden, complete with a lake of pink flamingos and herds of animals acclimated to safari cars. They were much less flighty than the migratory herds of the Serengeti. Plenty of buffalo, a favorite meal of lions. My son loved the reptiles, but my daughter’s favorite were the playful, mischievous monkeys. One baboon snuck into a car and stole the driver’s lunch, pooping in fright when the man returned. The driver yelled at the culprit then burst into laughter with us. 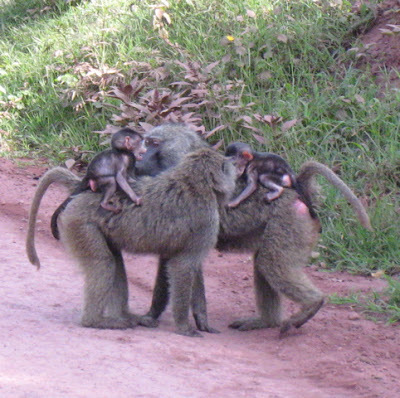 Baboon babies ride their mothers like jockeys. The young are always playing tag and wrestling, dashing back to mom for a snuggle. My daughter couldn’t stop laughing. 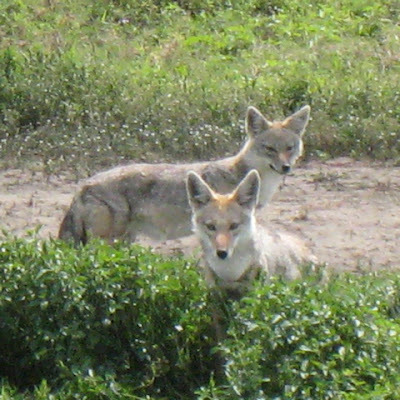 I was very moved by the jackals. We found one licking his dead brother’s nose. Although usually shy and jumpy, he would not run off and leave him as we drove by. We saw jackals working together to catch a flamingo. Two chased the flock on the edge of the lake while one grabbed a slow flamingo by the wing. The elephants were the most fun to watch. I can’t bear to see elephants in zoos – they look depressed. In the wild they show their various personalities and sense of humor. At Lake Manyara National Park we were surrounded by a large troop. Young bulls were trunk wrestling in play. When challenged by an older brother, a small elephant grabbed a bush with his trunk and shook it. You don’t scare me, he seemed to say. You can tell when elephants have passed as they knock down trees just for fun. They punch holes in huge baobab trees (first photo) in search of water during the dry season. Elephants also appear affectionate with each other. I could never tire of watching them. 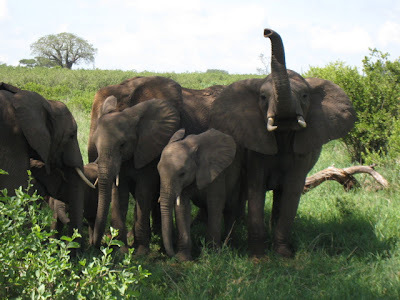 The best place to find elephants was at Tarangire National Park, our final destination. It hosts the largest African elephant population, which are attracted to the river. We even saw a newborn, small enough to fit under her mother’s belly. The elephant (above) with her trunk raised is calling others at a frequency too low to be heard by humans. I missed the first Tarangire game drive to recover from a stomach bug but saw more animals than they did by staying at Swala Camp. 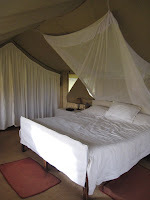 The tents had raised wooden verandas and deck chairs, perfect for watching wildlife. My book, Barack Obama’s brilliant Dreams from My Father stayed unopened as I watched the many birds with my binoculars. I saw 2 elephants lumber by, then came the resident herd of leaping impala followed by the water bucks. After a day of fasting and antibiotics, I felt fine and enjoyed the delicious Swala Camp food. Stomach bugs are common in developing countries – drink only bottled water and avoid fresh veg and fruits you can’t peal. Travel with Immodium IB, and if it doesn’t work, antibiotics (Ciprofloxin.) Antiseptic wipes and rehydrating powder are also a good idea. On my way to breakfast, I felt someone watching me. 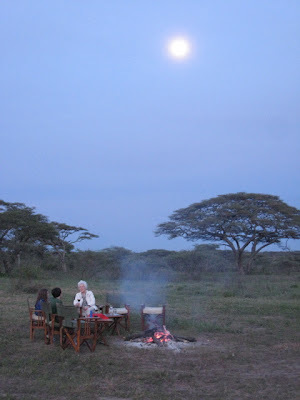 The night before a Maasai guard dressed in red robes had walked us back to our tents. He checked for leopards up the trees and behind bushes with his flashlight. He wasn’t there during daylight hours, and I didn’t have his spear or experience. 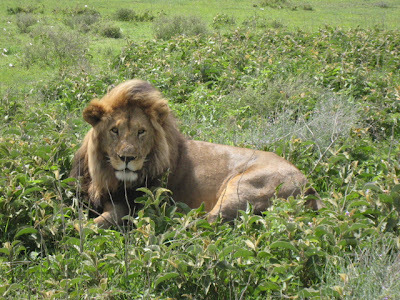 Traditionally Maasai used to kill a lion with a spear to prove their manhood. Lions still fear Maasai red. I turned slowly, remembering that you should always face a wild cat, never run from it. I laughed to discover only this giraffe in the morning mist. The resident vervet monkeys would have alerted the camp to unwelcome visitors. We novelists sometimes suffer from overactive imaginations. 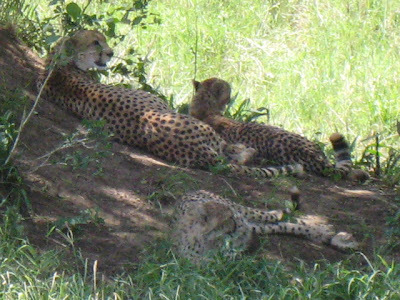 I was delighted to see two family groups of cheetahs during our game drive. 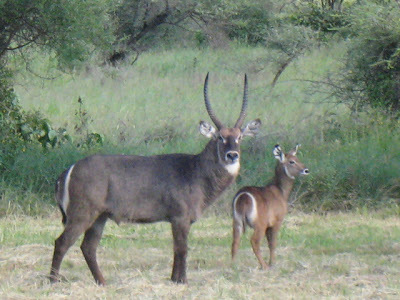 This was a record since the tall grasses and heavy woodland in the Tarangire usually hide them. 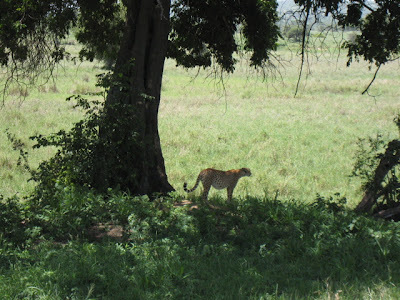 In Kenya I hadn’t seen any wild cheetahs, but in Tanzania we saw a total of 12 in 3 parks. 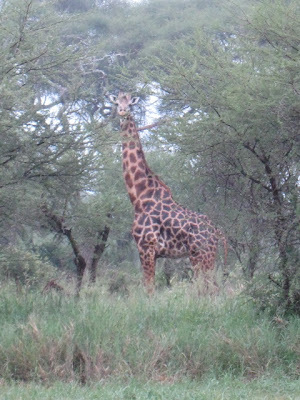 I attribute this to the excellent spotting skills of our guide, Ally, and our driver, Athumani Nyombwe. Only once before had I seen an elephant face me and flap out ears like a blow fish expanding. That elephant had charged me. 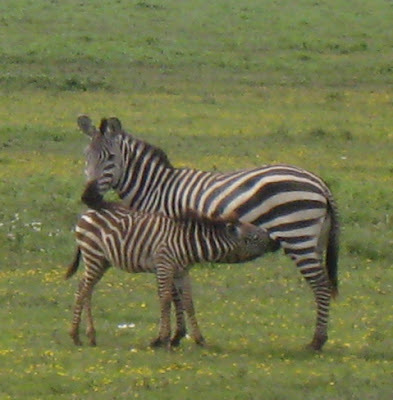 She was on one side of our camp in Kenya, and her baby was on the other. Twelve of us jumped into one small Land Rover. She stopped only feet away and went to her calf. We were lucky. Angry elephants have been known to total cars, smashing windows, ramming engines and even tipping over trucks. The bull in Tarangire was both angry and serious. If it is possible for an animal to hate, this beast hated humans and wanted to crush our 8 man Land Rover. He bent one knee and balanced on his trunk like a runner before a sprint. Without losing their calm, Ally and Athumani broke into Swahili. Ally warned us in English to hold on as we would be going around the elephant. It all happened too quickly for the others to worry; only I knew what was coming. I smiled encouragingly at my young daughter as I watched the angry beast grow bigger in the window behind her. The bull trumpeted angrily, so loud it drowned out our engine. It was a scene out of Jurassic Park only real. The ride was bumpy, and we slowed to avoid bushes and fallen trees that the elephant just trampled. On road we could outrun an elephant but not cross country. He was gaining on us. I tensed, ready to grab my child away from the elephant side of our truck if necessary. I was scared for her. My son was on the off-elephant side in the back with Henry. Our skilled driver swerved a sharp right behind a bush back towards the road. The elephant thundered past, unable to change direction at top speed. We sped off down the dirt road all talking at once. We praised Athumani (in photo with Henry) for keeping his cool and driving so well. 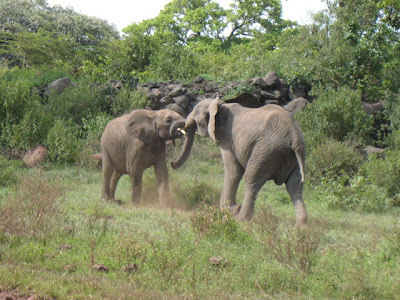 Ally explained that this aggressive behavior in an elephant was unusual. The bull had probably wandered off the park and raided a farm. The poor farmers would have shot arrows and thrown rocks to defend their crops. This elephant had learned that humans were dangerous. 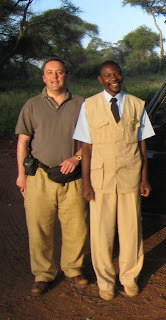 In fifteen years of tour guiding, Ally has had only 5 elephant scares. What are the odds that it would happen twice to me in just two visits? Sometimes life can be a recurring nightmare; other times it is inspiration. Despite the dangers and the illnesses, I was still sad to leave Africa. Maybe I could return to this beautiful country of my dreams by writing a novel. I will also be making a donation to a school Ally is starting. It is for Serengeti children so that they can learn to appreciate and to protect wildlife and become well paid guides or rangers. They would need to learn English and French as well as Swahili along with a lot science. Such a school does not exist in the poor region that is so rich in wildlife. 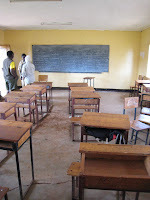 In Tanzania free public education exists only for primary school. Secondary schools require fees and an entrance examination. There are also too few schools and teachers. Even primary schools are often started by parents to supplement the thin government subsidy. It is not unusual to have 50 children in a class, no electricity or plumbing and teachers earning minimum wage. Parents provide the lunch of beans and rice. I really like the photos and this blog! 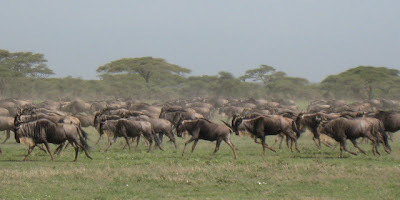 There were so many wildebeests you have to see it to believe it! I loved the baboons and the cheetahs!!! The baby elephants, baboons, and zebras were really cute!♡ I'd have to say that I am now much more scared of charging elephants than tarantulas since we actually HAVE been charged! 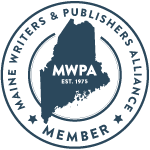 :-) Thanks for posting this blog! I hope that you post even more photographs. This was a lovely treat! And now it is spring in England - lucky you for daffodils and flowers springing up. It will be a long while here. What a great antidote to the torrential sleet we're having here! Lovely photos, Sarah, and what an adventure. The baobab tree made me think of the little prince. How right you are, Charlotte. Tanzania is storybook country. I kept looking for Barbar or the Little Prince. The Baobab loses all its leaves during the dry season and looks like an upside down tree with its roots in the air. It stores water in its thick trunk and can live for centuries. My daughter and I called them broccoli trees after her favorite vegetable. It appears I've found the cure for arachnophobia: let loose the charging elephant. I hope I haven't traumatized my daughter for life. Actually, we all thought it was the best vacation. Kate, thanks for your kind words. These photos were only a mere fraction of what I took, but I'm not going to inflict any more of them on my readers unless I return to Africa - perhaps in another novel. I'm busy with S.A.D. and NOT CRICKET after the fun break. I'm still trying to track down Ali for information about his school. My Tanzanian postcards are only just arriving in the US now so it may take time. I've added Ally's contact e-mail to the end of the post for donations to the Rolling Stone Foundation School. 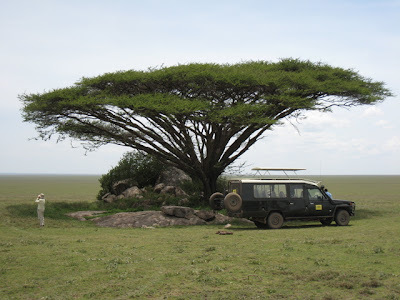 I am traveling solo on the A&K Tanzania Hemingway safari in Oct. Any suggestions on packing or anything else? Welcome to my blog, Jennifer. A&K will give you a packing list. You wont have much room to bring stuff. Light weight clothing that covers you from bugs and sun would be best. The one thing we didn't have enough of was American cash to tip - you need a lot. Check how much is usual and if you can get to cash points. Have a great trip and come back and post another comment here when you come back, If you like. Have fun!